Here I am again at Camp Foley for my 4th of 5 stints. This time around, I brought Mac. Usually Mac refuses to be separated from me. He generally sits on me in public. At my violin lesson, he leans against my legs while I play. Because of this trend, I was a little nervous about Mac's role as a day camper. But, he surprised me! "I know I have to do things on my own," he told me this morning. And sure enough, he went to every activity - ski boat riding, archery, water games, fishing, and nature class - without crying. At lunch, he told me he wasn't going to sit with me. He'd be busy with an older girl camper. 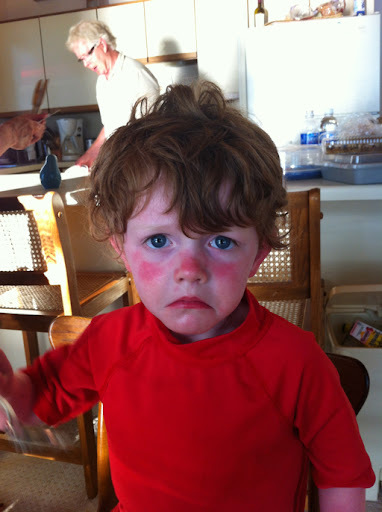 After dinner, he cried when I told him he wasn't invited to evening program. You really rose to the occasion, Mac! Must be because you're "already four." Shef's at camp now. He's been gone for almost a week. It's so weird! I always feel like I'm forgetting something. Mac is here, thank goodness. And he's really HERE. Last night he fell asleep in his own bed, but then woke up having a nightmare about bats. Then, he slept right next to me, maintaining physical contact. Today, the Wildlife Management guy is coming to inspect. I have a bad feeling that we have a bat's nest again. We had that in our old house. It costs a lot to eradicate a bat's nest, but I'm sorry - it's something you just have to do. Dan fell asleep in Mac's room last night while putting the latter to bed. When I went up at 11, I found the little guy at the top of the stairs, 100% awake. "Mac," I said, "you have to go back to bed." "I CAN'T!" He told me, face smushed up, "DAD is ASLEEP in my BED!" So, fine. It's a toddler bed. Not like there's really room for two. Mac came to sleep with me in the big bed. I'm pretty sure I shut the door before we nodded off. Later, when Dan wandered in at 4, I moved Mac to the middle and rolled over. That's when all hell broke lose. Dan made a sound and slammed the door. "There's a bat," he said. Over the next 30 minutes, we peeked at it. Every time, we slammed the door after witnessing it flying down the hallway. We donned protective clothing and shoes. We argued about whether bat hunting is a suitable task for delicate females (that's right, friends, I'm not above evoking age-old stereotypes when flying rodents are on the scene). Finally, one of us stood watch while the other retrieved tennis rackets. Then, Dan led the sneak attack down the hallway. I followed with my racket and my plastic shield (the top of a storage bin). Friends! He got it on the first swing! We worked together to remove it, and he flung it victoriously in a construction dumpster outside! All was well until this morning it occurred to me that we might die from rabies. Even though I've been exposed to bats millions of times, mind you, while working at Camp Foley. This particular time, I might die from rabies. I asked Facebook, and peeps told me it was indeed possible. So, now we're waiting for the animal control guy to come over and pick up the bat and test it for rabies. If it's positive, we'll get shots or something. Overall, I could have lived without this experience; however, we can all agree that Dan is incredibly brave and attractive. Dan is our masculine hero. I read the last book of The Hunger Games. I had put this off for awhile because my students told me it sucked. It turns out I disagreed with that assessment. I actually quite liked it. This just goes to show you that you can't trust kids. I got a babysitter today. Her name is Maggie and the kids actually like her quite a lot. However, Mac seemed to have forgotten that when Maggie arrived this morning. So, here's what he did: he locked himself in the bathroom, began sobbing, and also shouted, "I DON'T LIKE YOU! I DON"T LIKE YOU!" I was a little embarrassed by this. What I decided to do was to follow the advice I read in a parenting book. I stated my expectations: "You're going to have fun with Maggie!" and then I achieved separation as fast as possible. Went over to the bus pick-up point and dropped Shef off for two weeks at camp. The same camp I work at. He's ridiculously excited, and he's also a little bit anxious. Like, he asked me about three times what would happen if he failed the swim test, even though he passed the swim test last year. "You'll take it again tomorrow," I told him. "It'll be fine." "But, Mom," he said, "that would really mess up my activity schedule." Last year, we were worried that Mac would be sad and lonely without Shef here at home, and it turns out that was not the case. It turns out, Mac loves to be an only child. He can't get enough of Shef being at camp. Adios, Shef! Smell you later! I'm at camp again. This is the third of five trips up here for me. Last night while I was having my ice cream cone, a group of little girls walked by with their counselor. They were on the way to jump in the lake for a cool-off swim. They'd just been at the Grand Dance Festival, and they were belting out "What Makes You Beautiful" by One Direction. That's the kind of thing I liked to do as a counselor. Walk and sing. But instead of One Direction, we'd be shouting tunes by The Backstreet Boys or the Spice Girls. I'm on my way now to continue my job as office worker. One thing about being an office worker for the last three days of the session is that kids have no idea who you are. I ate dinner with a couple of girls from my seventh grade English class last night, and suddenly a guy on an adjoining bench yelled at me, "WHO ARE YOU?" He had a good sense of stranger danger. My tasks have been less random this time, but still busy and fun. I hope I'm doing a good job. Everyone knows I love to be the best. He's the master of the sad face, right? He's really good at that. It reflects a general feeling he's having lately. A feeling of indignation about being littler than Shef. Read two more books. One was my faculty summer reading book, Whistling Vivaldi: How Stereotypes Affect Us and What We Can Do by Claude Steele. This is a fascinating summary and discussion of research about "stereotype threat," the idea that if you feel like you might confirm a negative stereotype about an identity group you belong to, you'll have a harder time succeeding at tasks. An example is this: highly educated women students in mathematics perform less well on a difficult math test than men in mathematics when told that they're taking a difficult math test that measures ability. When students take the same test, but are explicitly told that the test is about problem solving and that women do as well on the test as men, the women actually do as well or better than men. There are a lot more examples. The book was hella interesting. I also skimmed The Culture Clash: A Revolutionary New Way to Understanding the Relationship Between Humans and Domestic Dogs by Jean Donaldson. I learned some things about Pronto's brain and classical conditioning a la B.F. Skinner. I also learned that Pronto will require a lifetime of careful exercise, training, and attention. I really hope that pup is worth it. 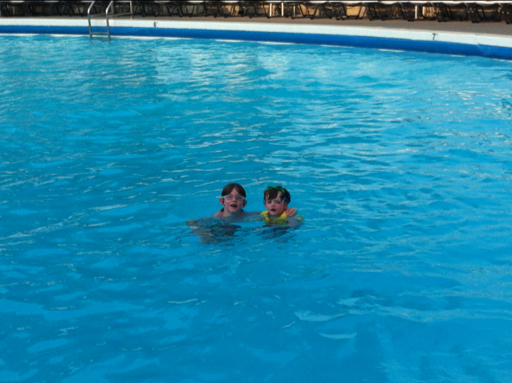 We survived the record 4th of July heat by spending about 4 hours in this pool. This is the kids swimming at dinner time. You might notice that Mac is in the deep end. Just chillin in his life jacket. He also jumped off the diving board a bunch of times. That kid is really growing up. Cute, right? And most of the time they're good pals. Sometimes, however, they turn into bickersons. Makes me want to read another parenting book called Siblings Without Rivalry. Read two more books. One was The Invention of Hugo Cabret, which most middle school teachers and kids have already read. I thought it was okay, but I wasn't all that wowed by it, to tell you the truth. Maybe that makes me kind of a bad person? I liked the art and all; it's just that I didn't love the story all that well. The other was the follow up to the parenting book I mentioned a few days ago. Instead of How to Talk So Kids Will Listen, this one is called How to Talk So Teens Will Listen, and Listen So Teens Will Talk. It was an interesting review of the ideas presented in the previous book with some solid tips for positive communication for all. Here's a takeaway that has me thinking my jobs as Mom and Teacher: "Punishment has no place in a loving relationship." Overall, I feel enriched by my summer reading. I checked out some new books at the library. One is called Culture Clash, and it's about getting your dog to not be completely insane. Not that anyone here has an insane dog. It's just a theoretical idea - the Crazy Dog identity, and what it means for humankind. I'm just back from my latest stint as a camp worker. This time I did the weirdest mix of jobs ever, I think. First, I did my regular jobs of proofreading and editing. Later, I did my other regular job of coordinating and organizing awards. Otherwise I did tasks ranging from emptying the garbage to organizing dining tables into whimsical shapes. Now I'm back to my usual jobs. Should be a good, but wickedly hot, week.